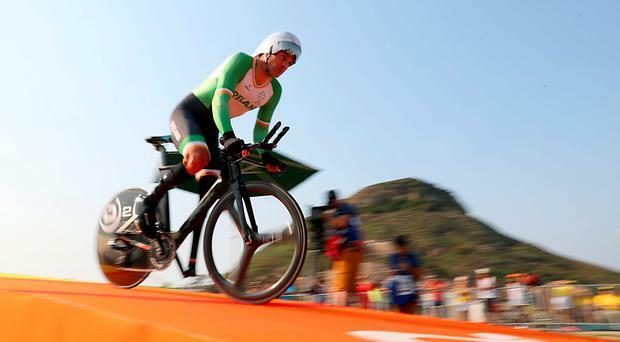 Ireland has secured a fourth medal of the Paralympics after Colin Lynch won silver in the C2 Time Trail. Lynch clocked a time of 28:02.25 and finished second - 19 seconds behind the victorious Tristen Chernove from Canada. Jason Smyth (gold), Michael McKillop (gold) and Eoghan Clifford (bronze) have all won medals in Rio so far for the Irish team. Speaking from Rio, a beaming Lynch said: "It’s four years and to achieve the one thing I didn’t have, a Paralympic medal. It was really close and I was trying to figure out how to get everything out of myself. It was really really close." He told RTE Sport: "I put all year into this one ride today and I'm pretty pleased. I would have obviously loved to have won the gold and it was close but to come away with a medal, it's a four-year dream. "At the halfway point I knew that I was only 11 seconds down so I was driving as hard as I could to make that up. The other guy didn't take too much more time out of me but it was a tough day out there with a lot of wind. "I gave it everything I had right to the line so there was no more I could have done." Earlier in the Games, Lynch finished fifth in the Individual Pursuit competition, narrowly missing out on a bronze medal ride off. At the 2012 Paralympic Games in London, he missed out on a track medal by one tenth of a second. Lynch grew up in Canada while his father is from Drogheda. He took up competitive cycling in 2008 and pursued his competitive career winning his first time trial world title in 2011. In 2015, he won two golds on the UCI World Cup Circuit and this year won a silver in the 3km Pursuit at the World Track Championships.